One of the most common, and utterly ridiculous, criticisms of “organic” methods of agriculture is that they can’t keep up in quality and volume with conventional chemical methods. I am prone to picking fights, and this one gets me spitting mad. It takes forms as benign as my family condescendingly nodding their heads as I describe my deep mulching to make my own fertilizer (while all the while musing about all the money I am throwing away when my perennials die), to the much more damaging argument that a switch to organic methods would doom the world to starvation-we can’t “feed the world” without Big Ag. That is a load of hooey, and my .1 acre project is hell bent on proving that. So here are some “Where’s Beo” shots of my gardens to lend some perspective, literally, on organic methods. Right, so that is my ugly mug about 2/3 of the way up my Golden Bantam Sweet Corn. I am 5′ 7″. All of these shots will look weedy, but that is due to the polyculture plantings-in this same bed is also basil, beans, and melons. One of my 7 Tomatoe Teepees (4 plants each). This one is some of the freakishly vigorous yellow pear plants from Seed Savers. The plants have easily climbed over 6′ tall in less than 2 months! The teepees are so sturdy that I didn’t lose a single plant in a particularly vicious storm front last week with 50mph winds and 3-4″ of rain. This bed also contains 1.5 dozen pepper plants and has an understory (waaaay under these days!) of white dutch clover for weed suppression, insect attraction, and nitrogen. The teepees also offer fantastic habitat for our black and yellow garden spiders which are superb general predators taking the edge off any pest invasion. This is a shot of one of our native beds. Not a prairie as it was planned primarily for aesthetics but all plants are native to Wisconsin. The cupplant I am behind are only 3 years old and are well over 8′ tall with leaves the size of dinner plates. This bed has seen no fertilizer other than deep mulching-and the droppings from the numerous voles, sparrows, finches, and chickadees that frequent it! The key to any gardening regime is meeting the plants needs-the heavy feeding corn, melons, and tomatoes got a very healthy dose of horse manure (1-2″). In addition the tomato bed was cover cropped with a rye/vetch last fall, and the corn bed was the bottom of the massive sod based compost pile of last year’s prairie restoration. The beds also had prep with green sand for trace nutrients, and periodic applications of either composted chicken manure or fish emulsion. With the exception of the fish emulsion and green sand, all of the inputs to these beds are readily accessible on any well balanced (livestock+diverse plantings) small farm-the way 90% of farming was done in Wisconsin 90 years ago when my grandfather was supporting a family of 10 doing it. I will put my yields up against anyones-and this is on only 3 year old gardens on top of a soil made up of a sand/gravel/clay mix from a quarry used as backfill in our subdivision. “Beyond” Organic Farming works amazingly well-my 8′ corn has impressed the heckfire out of me. I got 40#’s of potatoes off of 100 sq ft-that works out to about 9 tonnes per acre which compares very favorably with conventional yeilds… and that is with a lower yeilding Purple Viking strain v. the typical Russets. Faithful readers will remember that our HOA Permaculture experiment abuts I-94-as in the backfence of my prairie restoration is owned by the D.O.T. There is a long story of us backing out of a farmette due to unforeseen structural problems with it- with only weeks before our house closed and despite herculean efforts we were unable to find another property in time. That was three years ago, and we have managed to make the beginnings of some pretty good lemonade with our lemons. Back to the D.O.T., or more specifically the letter that we received from them yesterday. 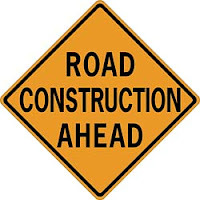 It seems that next year they will be doing massive work on a 25 mile stretch starting from our backyard and going East. This is no simple resurfacing: the will be raising bridges, widening exits and shoulders, and generally tearing things up royally. No worries though, the letter goes on to say, as there should be little to no impact to traffic because the work will take place at night. Sleeping will get very hard next summer. If we do move now we will need to drop down in home size to make up for realtor fees to stay on track for our 5 year deadline. Making a step up to a farmette in the current economic uncertainty would be foolish. That said, the town next to us allows chickens within city limits so a smaller home there has some appeal, and my harebrained ideas would look less out of place if we did not live in a planned subdivision. If we do not move I think next year might see some new experiments-this time in green building and energy. 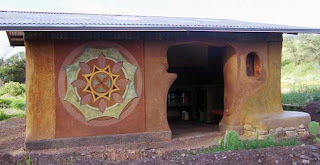 I have reached a point where a potting shed/greenhouse would make things much easier, and after a quick search of strawbale construction I turned up the Canelo Project infusing art in their built environment. The “Architectural Control Committee” would go into hysterics over something this “hippy”, though even my pragmatic heart is moved by the flowing lines and soft tones, so something more mainstream would be needed. But I am enamored with the concept of a passive solar greenhouse/shed that is also off grid to power a few lights and charge my cordless electric yardening equipment. If we weren’t moving I would put a 1000 gallon cistern under the foundation fed by the roof and use a solar well pump to pressurize an irrigation system. The thinking is the same as the the orchard-make my mistakes on a 150sq ft structure before I build a 1500 sq ft one. This is probably all simple musings. I spoke to the lead engineer of the project I am supplying rainbarrels for and the project will continue thru winter 2008 and he is looking for hundreds more. Screw the potting shed-I need a bigger garage. One can’t help but think that something much, much cooler could have been accomplished with a restored tank. That simple sentiment has spawned a revolution of sorts… at least in the small world that is the Mia/Beo household. It is why any “new” clothes are either purchased used or seen as a chance to vote with our dollars with retailers such as Patagonia, Prana, REI, etc that are offering fantastic clothes from sustainable or organic fibers. It is why I have converted 20% of my backyard to food crops-and half of those beds are what I can safely term experimental to push the edge a little farther. It continues in these blogs, in my hybrid evangelizing, and in the mini seminars I hold at work over coffee on the CCX, nutrient cycling in landscapes, or the local eco-nomy that we are helping to build and support. As if we had any doubt…We’re living it. A brief synopsis of this picture perfect day. Slept in past 7 (had stayed up late doing an 8 hour blitzread through a new fantasy novel), cooked myself breakfast (local eggs and fresh bread cooked the evening before) as the family had eaten and then drove with the family to take the kids to ballet lessons with the Milwaukee School of Ballet. From there we headed over to our preferred independent organic grocer for some staples (steel cut oats, flour, wine and eggs-we grow much of our other food in June/July/August), and then a quick kiss to Mia as she headed off for a meeting on a job that she was considering taking on that would add 50% to her gross income and I returned home with the kiddos. The fact that we are solvent enough to “consider” job offers is not taken overly for granted-at least not today. Lunch was quick (salad with peppers and raspberries that I picked 5 minutes before), and then Bird went down for a nap while some storms rolled thru (only .25 inch but I’ll take it!). Mia returned in time for the nap and we enjoyed some quite(r) time weeding and harvesting until Bird woke up, and then we went to a nearby lake for a quick swim. Now I am sitting outside in the sun, beer on arm rest and grill to my left while Mia prepares some potatoes, basil, and beets from our garden that I will finish on the grill presently as the kids play around us. The trees came in last week! Of course they came 22 hours before I was set to leave on a 1300 mile trip to marry off my best friend, so time was of the essence. I was able to get them in the ground with a modicum of marsh hay mulch before we left for Missouri, and was distracted most of the trip praying for rain while we were gone (unanswered, though the wedding was almost canceled due to tornadoes!). Upon our return I spent the next day sourcing materials to finish the beds on my back-hauls from delivering Rain Barrels to clients. The picture above shows the prep work as I left them last Thursday: on the right is the Speckle Pear with a Paw Paw on the other side of the bed and a pair of Hardy Kiwis on the fence. Edible Landscaping was unable to meet my order on the Paw Paw and only had 1 gallon trees on hand-hence the 18″ tall “tree”. What is impossible to see in this shot is the 3 French Sorrel, 2 Russian Comfrey, 2 perennial Clovers, 2 New Jersey Tea’s, and 2 Hazelnut Shrubs that are also part of this polyculture. The grass surrounding this planting will be sheet mulched this month in preparation for more plantings next year. At left is another of the tree guilds, this time anchored on an Asian Hosoui Pear Tree. This guild butts up against a 300 sq ft native planting that will provide a significant degree of diversity in both soil and insect life. This picture was taken after I had added a 3″ layer of 9 month old leave compost from our village yard. The pile was steaming when I forked it into my trailer so the soil ecology will get a nice jumpstart of microorganisms! This bed includes New Jersey Tea, Comfrey, Nodding Pink Onions, and Garlic Chives in the understory, with another dozen or so prairie plants within 10 feet. In the background can be seen some of my compost bins and the tandem rain barrel set I am moving from the front yard to make room for a new, larger system I installed last week. The bed at right has the second Paw Paw mini tree and the usual suspects in the understory. This demonstrates about how the beds look “finished” with another 4″ of wood chips from the village yard on top of the 3″ of compost. In the front yard I have the 2 peach trees in similar guilds, though one gets a mulch more elaborate understory complete with multiple nitrogen fixers and a bastion of beneficial attractants from still more native plantings and our large rain garden. I am lavishing plants on these guilds in my respect for the impending pest pressure that the peach trees will undoubtedly experience. A few more thoughts on my prep. I took the unusual permaculture step of ripping the sod off. This is typically a no-no as you deplete the soil of its organic layer and much of its ecology. However, my sod is rife with quack grass and I had no interest in giving it a leg up in my forest gardens. Their rhizomes laughed at the 1′ overlaps of 4′ pallet sheets under our play system with shoots coming up in a nice 4′ checkerboard. I have a strong dislike of that plant that borders of hatred, but I cannot deny its evolutionary chutzpa. So the rhizomes were removed leaving only the subsoil back-fill. Without a year to add a topsoil layer through sheet mulch, I purchased 8 yards of a topsoil mix (Peat/Sand/Topsoil) that I layered on about 18″ thick and then lightly tamped (ok I walked on it) and into this I planted the trees. I did break up the subsoil compaction considerably with a mattock (it scoffed at my digging fork and fancy imported spades) before planting. My intent was to mirror a forest soil strata as much as possible, so starting with my subsoil back-fill and placing topsoil on top of that, I then applied the 3″ layer of mostly decomposed leaf litter from last years leaves. This simulates the micro-organism rich layer immediately beneath the surface in a true forest-the layer that feeds 90% of the plants in the forest. On top of this, the wood chip layer mimics the carbon rich mulch found in any forest-consisting of fresh leaf litter, twigs, and fallen branches. This is the layer that will provide the fuel for future generations of my soil ecosystem, while also protecting the soil from compaction and the suns rays. All trees were also inoculated with mycorrhizal fungus spores prior to planting to give the beds a more balanced soil system. Next steps will be ensuring that the trees survive the ordeal of being shipped half way across the country and transplanted, and then to sheet mulching the rest of the lawn in this section to prepare the way for next years plantings. Only other additions planned for this year are some gooseberries and perhaps some strawberries as ground-cover and fungus inoculant to encourage decomposition of the mulch layers. Will it work? Can I grow a suburban orchard “beyond” organic-with virtually no future inputs besides mulch? The next 3-5 years will tell!